Lucky for me, this stacked potato slice thing exists elsewhere, so I was able to find another recipe to adapt. I ended up having to make this twice to get it right; even the second time, the top layers curled a bit more than in the pictures I’ve seen elsewhere. I’m attributing this to the fact that I used sweet potatoes instead of white ones. 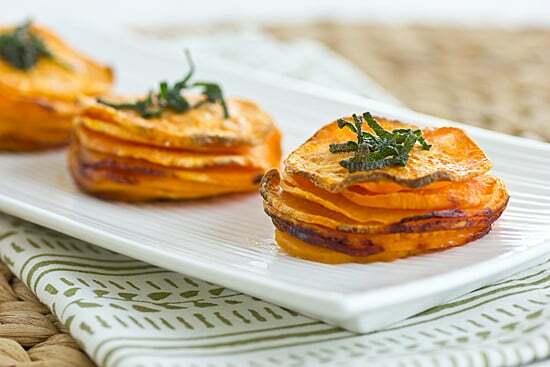 Although it’s a little bit time consuming to stack the potato slices into muffin tins, the results are worth it–sweet potato stacks that are crispy on the outside and perfectly roasted and tender in the middle. And they look even more impressive in person. Stacks of thinly sliced sweet potatoes topped with crispy ribbons of sage. Adapted from A Zesty Bite’s Roasted Potato Stacks. Spray four cups in a muffin tin with olive oil. Place a sweet potato slice in each cup; spray top of slice lightly with more olive oil. Repeat until cups are filled and sprinkle with salt and pepper. Bake for 30-40 minutes or until edges of potatoes become crispy. While potatoes are baking, heat olive oil in a small skillet over medium-high heat. Add sage leaves and saute, stirring constantly, for about 3 minutes or until leaves are crispy, but still green. Divide sage leaves onto the tops of the potato stacks. Eco Natural Soap Review + Giveaway What I Ate This Week | Burgers (again). These look yummy! wonder if this would work with sliced eggplant, olive oil and mint flakes? I don’t think eggplant would get crispy like sweet potatoes do. Do these REALLY get crispy in the oven. I have made sweet potatoes in the oven before and I never have had them get crispy like these look…..